I love this recipe for a cold winter's night. It is the tastiest shepherd's pie I've ever had. I use Jean Pare's recipe from Cooking for Two, but I double it each time. Here are the measurements for a double recipe (which feeds my family of 5 nicely). You can of course halve it to make the smaller 'for 2' dish. Heat cooking oil in frying pan. Add ground beef and onion. Scramble-fry until beef is browned and onion is soft. Drain. Combine the next 7 ingredients in saucepan. Stir. Heat to boiling. Cook slowly until carrot is tender. Add peas. Cook for 2-3 minutes. Add ground beef mixture. Stir. Pack into a casserole dish. Cover with mashed potato. Sprinkle with paprika. Bake, uncovered in 350* oven for about 30 minutes, until very hot. Yumm!! !....It looks delicious! Yesterday I made Janis' Oven Stew from the recipe club you started and dad and I both enjoyed it! It was delicious too!! 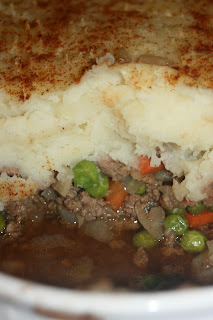 i was just thinking about shepherd's pie today. I like that you can make it for 2 too! Shepherd's pie has to be one of my all time favorite winter comfort foods. I can eat it til I practically burst!